Photo Coyote - Spider Man! A couple years ago, I bought this awesome Spider-Man action figure at a garage sale. The little boy who was selling it only wanted 50¢ for it, but I gave him a dollar. And, as it turns out, its worth is invaluable. I keep good ol’ Spider-Man in my satchel and carry him everywhere I go. The reason I do so is because there are a lot of bored children in the world, who would otherwise create a nuisance of themselves were it not for Spider-Man To The Rescue. Spider-Man’s greatest feat so far has been to keep a sweet but very active little girl occupied in a courtroom while her mother (and a bunch of the rest of us) waited for our cases to be heard. I was there to hold the hand of a friend who needed support, and in front of me sat a darling little girl who was doing her best to sit still, but her mom kept shushing her and telling her to stay put. Did the mom bring along anything to keep her daughter entertained? No, she did not. Can you say inconsiderate? Get a clue, mom! I was MORE than happy to relinquish Spider-Man into the hands of yet another little sweetheart who was expected to behave like an adult. She was so thrilled, it was amazing! Spider-Man became her dancing partner, her baby, her fellow super hero, her confidant. 45 minutes of creative play that didn’t bother a soul. I love Spider-Man. Anyway, this picture was taken at the train station in Everett, Washington while my teenage daughter and I were waiting for her overdue train. I WAS BORED! 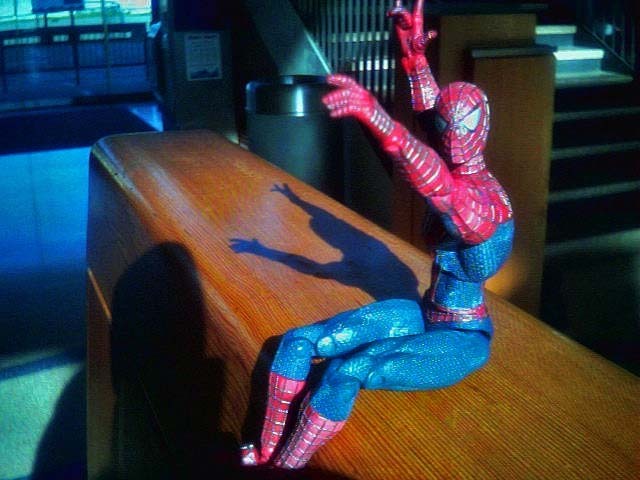 So I pulled good ol’ Spider-Man out of my satchel and had him pose for my cell phone’s camera. My daughter, of course, was horrified. She practically begged me to put him away to quell her embarrassment. But, did I? No, indeed! Let her suffer. Spider-Man rules! Do you ever have trouble retrieving him?